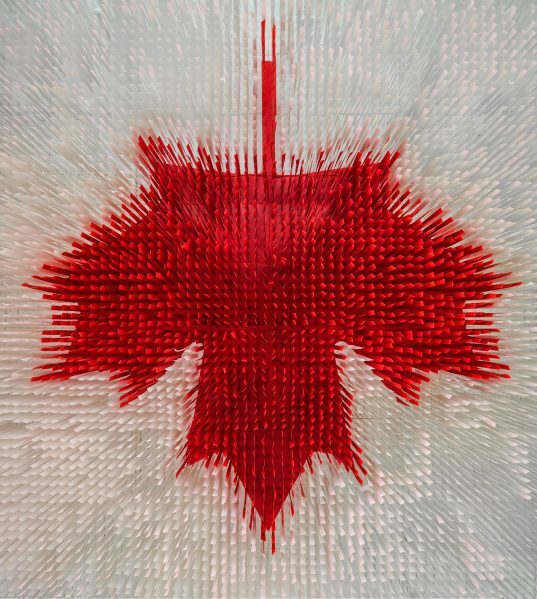 A stunning tribute to our home and native land, this ceiling-situated flag at Canada House in Rio de Janeiro during the 2016 Summer Olympic and Paralympic Games was made from coloured strips of drop-cloth, sourced from Canadian Tire. Designer Deborah Moss and her team at Etobicoke’s renowned Moss & Lam worked pro bono on this and other installations at Canada House because, in her own words: “The Olympics are beyond other projects.” Photo by Nelson Kon. Some professions you choose; others choose you. For Olena Kassian, co-partner in Toronto’s BARKAS Productions, the impetus was her architect-father. From a very early age, her playthings were the pencils, watercolours and paper he’d leave lying around their Toronto home. The creative passion followed her through high school, a degree from the Ontario College of Art (now OCAD University) and fine art studies at Guelph University. For many years afterwards, she worked as a high-realism illustrator – until the rise of the internet kicked the props out from under that career. From then on, she worked at art for art’s sake, producing abstract portraits, metalwork, shadowboxes and, more recently, powdered-graphite-on-Mylar drawings. And then, in 2012, she met Ann Bartok. Bartok grew up in England, with art-supportive parents; however, it was a secondary-school art teacher (an all-but-vanished breed in today’ s educational system) who spurred her on, not to mention got her into the Nottingham College of Fine Arts at the tender age of 15. Her professional work consisted mostly of 3-D commercial graphics and sculptures both before and after she emigrated to Toronto in the Swinging Sixties. Her roster of Canadian commercial clients includes Cadillac Fairview, the Royal Ontario Museum, Parks Canada and the Hockey Hall of Fame. Four years ago, she connected with Kassian after the two were hired to repair another artist’ s work in Brazil. “We had fun,” Kassian says, “and we worked well together.” So, at a time in their lives when most people retire, or at least slow down, the pair teamed up to form BARKAS. Growing up in the picturesque Humber Valley, west of Toronto, Deborah Moss says she always knew she’d be an artist. Her brother was one; so too was her great-uncle. Artwork and books on art history imbued the family home, a place tastefully decorated by her mother, who inclined towards interior design. Although her father was a banker by day, he loved to whittle and carve in his off-hours, and he, too, encouraged his daughter’s own artistic direction. 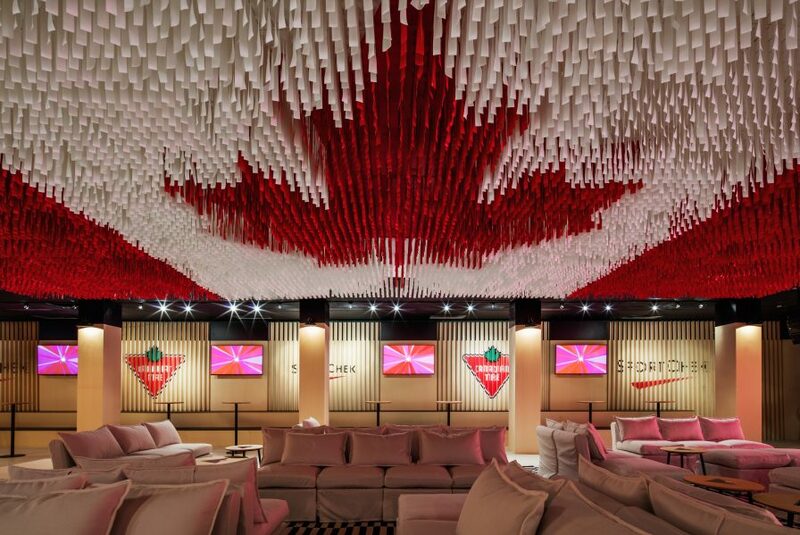 The flag set the tone for Canada House’s Celebration Lounge, where broadcasters, athletes and guests gathered to cheer the nation’s Olympic successes. Photo by Nelson Kon. The future co-founder (in 1989) of Etobicoke’s Moss & Lam studio studied practical and historical art in high school and at the University of Toronto. On the recommendation of a friend, Deborah then moved on to OCA. That friend, who ended up becoming both her personal and professional partner, was the brilliant Edward Lam, who died tragically in 2013, aged 54, of an unsuspected brain aneurysm. Deborah now manages her company’s new 13,000-sq-.ft. studio and 17 employees with the assistance of Jamie Stagnitta, director of operations and an artist in his own right. Moss & Lam’s extensive client list includes several Four Seasons Hotels, the Lotte department store in Seoul, Hong Kong’s Dalloyau Restaurant, and New York’s W Hotel Times Square. 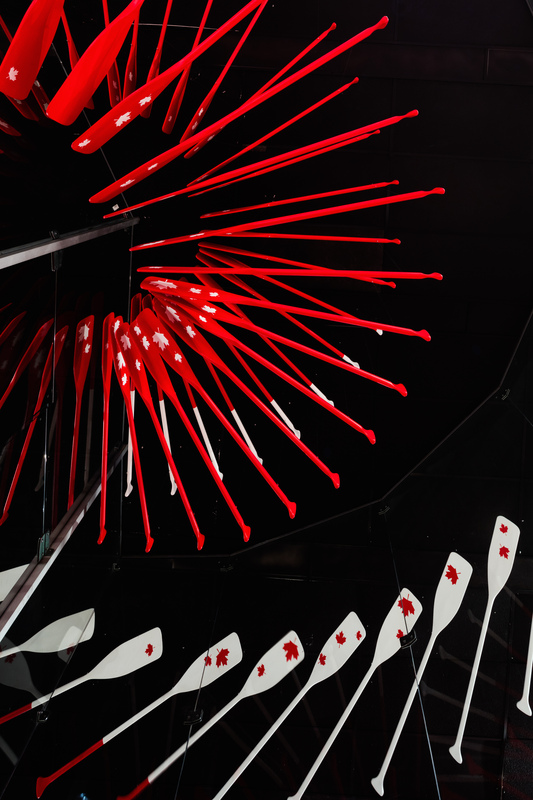 A spiraling mobile of red-and-white stencilled paddles led up from Canada House’s main lobby to the second floor. Due to timing and logistical constraints, Moss & Lam had to deal with a last-minute installation crisis, and drill in dozens of bolts through the flimsy Styrofoam ceiling into the concrete behind. Photo by Nelson Kon. 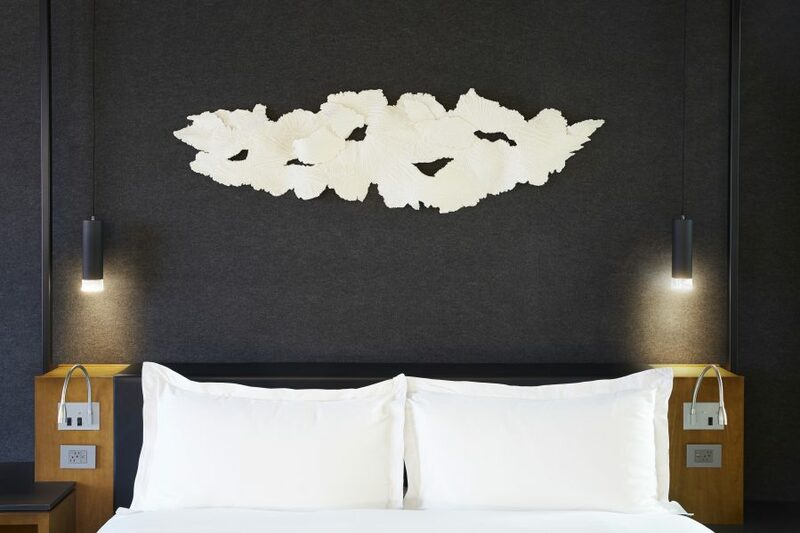 Ann Bartok and Olena Kassian of BARKAS Productions hand-made all 120 “Cloud 9” sculptures, which hang, featherlight, over the beds in Le Germain Hotel Toronto. “They wanted something elegant, beautiful and uplifting,” says Kassian. The client agrees that the pieces “elevate the contemporary atmosphere” of the newly refurbished hotel. The partners claim to be the only artists to use their special recycled material, made from bleached softwood fibre, in the same sculptural way. Their recipe is secret, but they will reveal that it involves several different types of kitchen appliances and implements. The result is something that resembles a thick, soft felt with feathered edges, imprinted with repeating patterns as the artists see fit. The Cloud 9 pieces, though each is unique, collectively resemble an assemblage of white wings swirling together in serene unity. 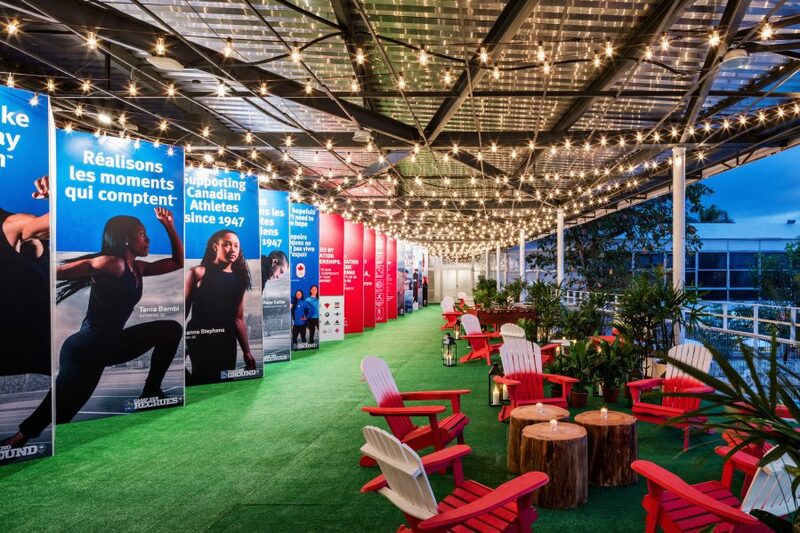 Evoking a quintessential Canadian backyard, the second-floor outdoor terrace is laid with vibrant green artificial grass surface, also evoking turf used for athletic fields. Photo by Nelson Kon. Back down to earth and the more mundane dealings of artists and designers, Kassian and Bartok echo Deborah Moss’s frustration with budgeting, especially when it comes to fee structures. Because art is habitually included under construction costs, designers often look to artists to help them reduce the bottom line. As Kassian puts it: “Spend too much on carpeting? Cut the artist’s fee. It makes us feel that our work is not as valued as, say, the accountant’s, or the lawyer’s. Are these contributors asked for a ‘deal’ ? The lesson learned? Your profession may choose you, but it’s up to you to approach it professionally.